Therese May�s May Flower #3 (pictured above) will be on display at the Gregory Kate Gallery at 925 The Alameda # 101, San Jose until the end of January. 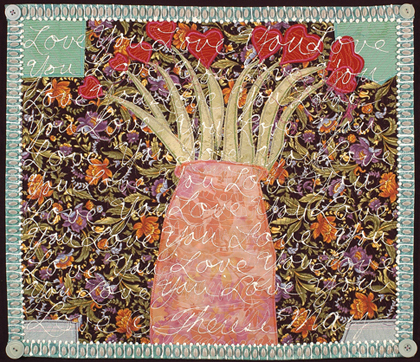 The exhibition features 20 different artists and their interpretation of the theme of LOVE. The gallery is encouraging you to visit and vote for your favorite artwork with cash prizes awarded to the winning artists. More of Therese's fine work is available at KALEID gallery at 88 South Fourth St. This page contains a single entry from January 20, 2008 4:24 PM. The previous post in this blog was Al Preciado at Willow Glen Books. The next post in this blog is Thursday Gig February 7th.